The wild turkey is native to North America and is the heaviest member of the diverse Galliformes. 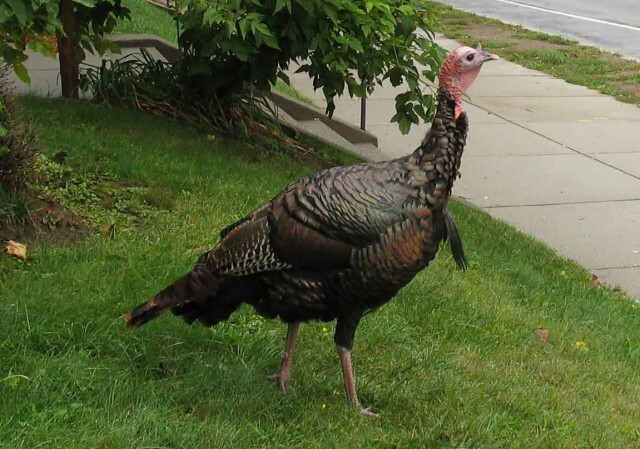 It is the same species as the domestic turkey, which was originally derived from a southern Mexican subspecies of wild turkey. 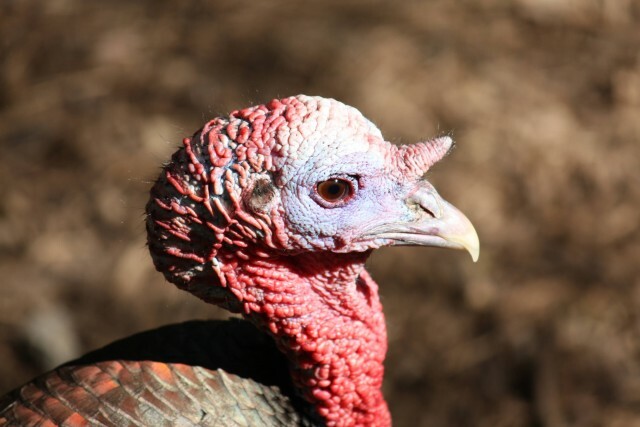 Although native to North America, the turkey probably got its name from the domesticated variety being imported to Britain in ships coming from the Levant via Spain. The British at the time therefore associated the wild turkey with the country Turkey and the name prevails. The Wild Turkey in the United States in 1957 ranged from Arizona to southeastern Oklahoma and thence through Tennessee, West Virginia, and New York, and south to Florida and Texas. It formerly ranged north to southeastern South Dakota, southern Wisconsin, southern Ontario, and southwestern Maine. The A.O.U. Checklist also described Upper Pliocene fossils in Kansas, and Pleistocene fossils widely from New Mexico to Pennsylvania and Florida. The Californian turkey, Meleagris californica, is an extinct species of turkey indigenous to the Pleistocene and early Holocene of California. It became extinct about 10,000 years ago. The present wild turkey population derives from wild birds re-introduced from other areas by game officials. 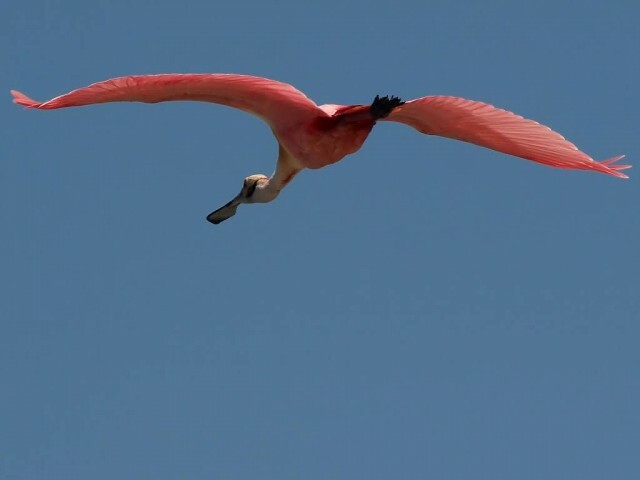 The roseate spoonbill is a gregarious wading bird of the ibis and spoonbill family, Threskiornithidae. It is a resident breeder in South America mostly east of the Andes, and in coastal regions of the Caribbean, Central America, Mexico, the Gulf Coast of the United States and on central Florida’s Atlantic coast Merritt Island National Wildlife Refuge adjoined with NASA Kennedy Space Center. 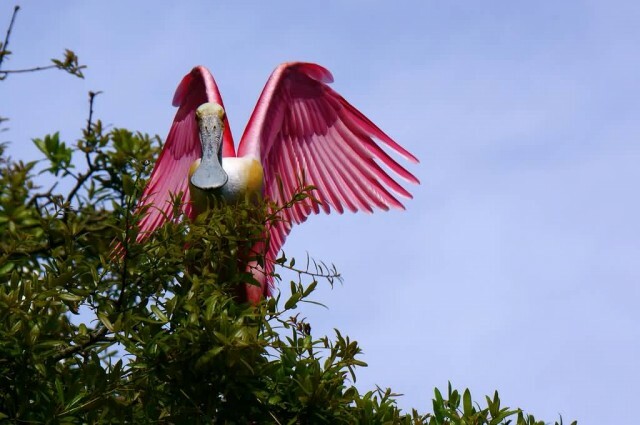 The roseate spoonbill nests in shrubs or trees, often mangroves, laying two to five eggs, which are whitish with brown markings. Immature birds have white, feathered heads, and the pink of the plumage is paler. The bill is yellowish or pinkish. Information about predation on adults is lacking. Nestlings are sometimes killed by turkey vultures, bald eagles, raccoons and fire ants. 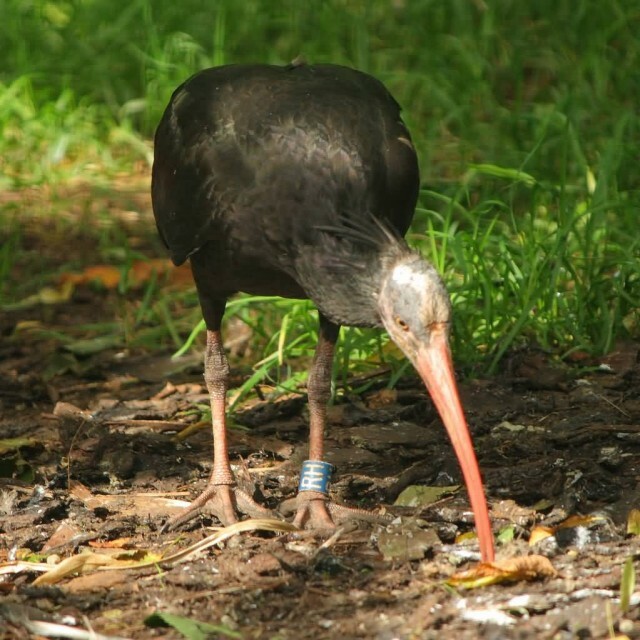 In 2006, a 16-year-old banded bird was discovered, making it the oldest wild individual. 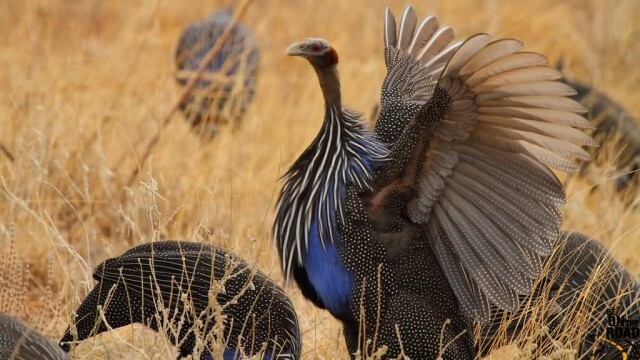 The vulturine guineafowl is the largest extant species of guineafowl. Systematically, it is only distantly related to other guineafowl genera. Its closest living relative, the white breasted guineafowl, Agelastes meleagrides inhabit primary forests in Central Africa. It is a member of the bird family Numididae, and is the only member of the genus Acryllium. It is a resident breeder in northeast Africa, from southern Ethiopia through Kenya and just into northern Tanzania. 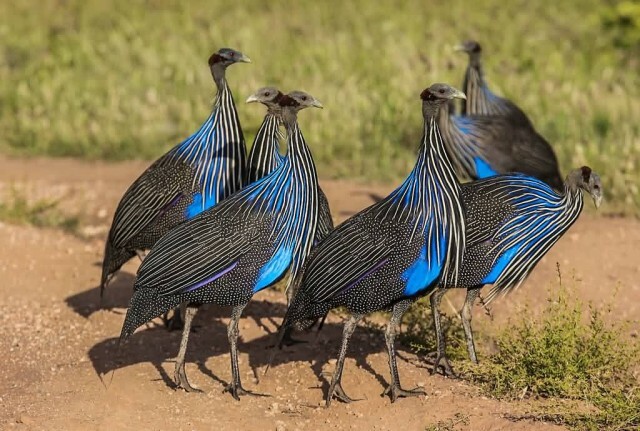 The vulturine guineafowl is a gregarious species, forming flocks outside the breeding season typically of about 25 birds. This species’ food is seeds and small invertebrates. 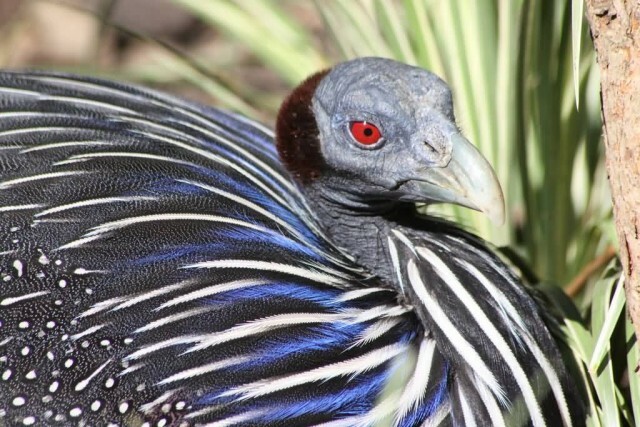 This guineafowl is terrestrial, and will run rather than fly when alarmed. Despite the open habitat, it tends to keep to cover, and roosts in trees. It makes loud chink-chink-chink-chink-chink calls. It breeds in dry and open habitats with scattered bushes and trees, such as savannah or grassland. It usually lays 4-8 cream-coloured eggs in a well-hidden grass-lined scrape. 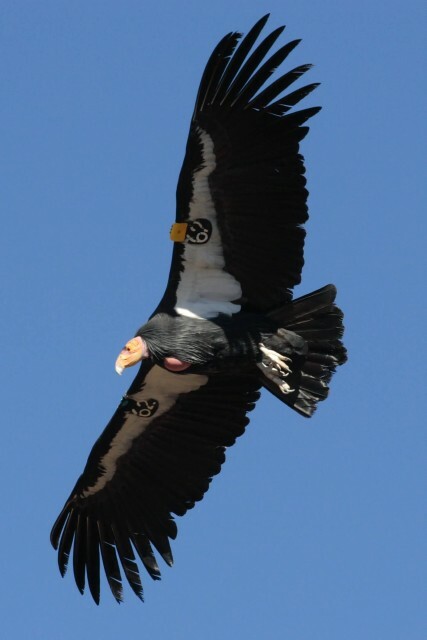 The California condor is a New World vulture, the largest North American land bird. 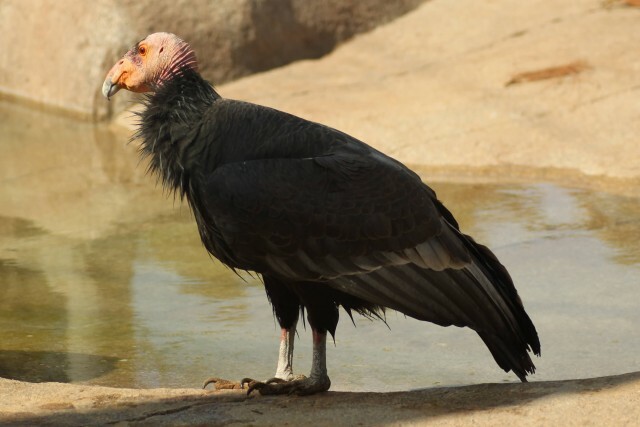 This condor became extinct in the wild in 1987 but the species has been reintroduced to northern Arizona and southern Utah, the coastal mountains of central and southern California, and northern Baja California. Although other fossil members are known, it is the only surviving member of the genus Gymnogyps. The plumage is black with patches of white on the underside of the wings; the head is largely bald, with skin color ranging from gray on young birds to yellow and bright orange on breeding adults. Its huge 3.0 m wingspan is the widest of any North American bird, and its weight of up to 12 kg nearly equals that of the trumpeter swan, the heaviest among native North American bird species. 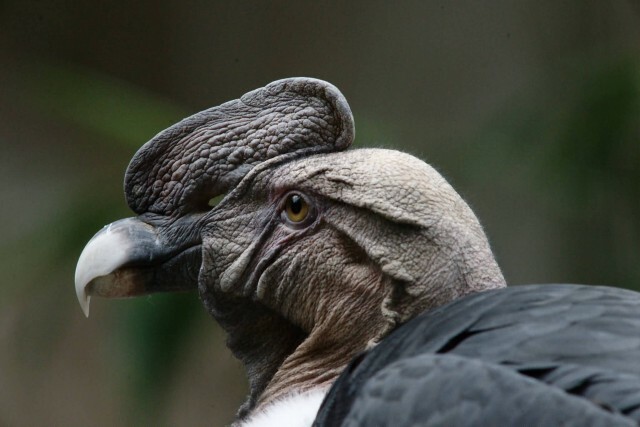 The condor is a scavenger and eats large amounts of carrion. 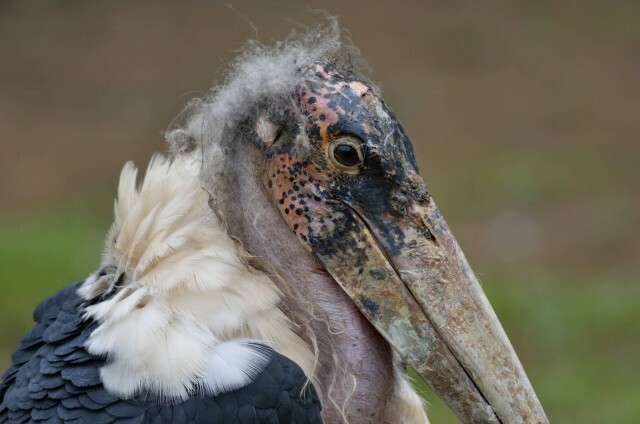 It is one of the world’s longest-living birds, with a lifespan of up to 60 years. 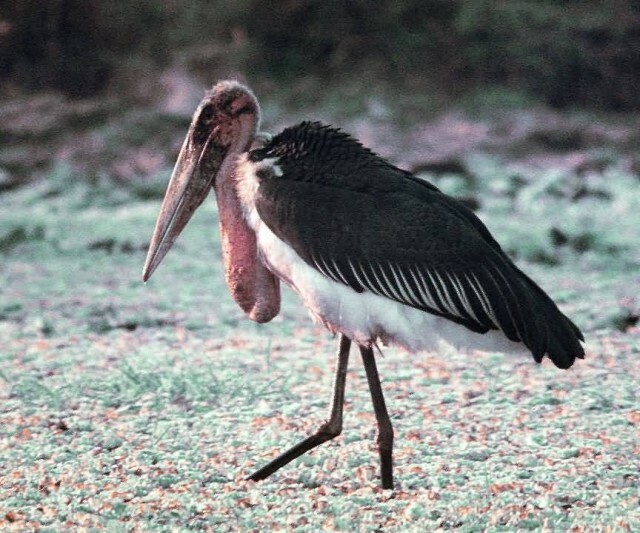 The marabou strok is a large wading bird in the stork family Ciconiidae. It breeds in Africa south of the Sahara, in both wet and arid habitats, often near human habitation, especially waste tips. It is sometimes called the “undertaker bird” due to its shape from behind: cloak-like wings and back, skinny white legs, and sometimes a large white mass of “hair”. Marabou down is frequently used in the trimming of various items of clothing and hats, as well as fishing lures. 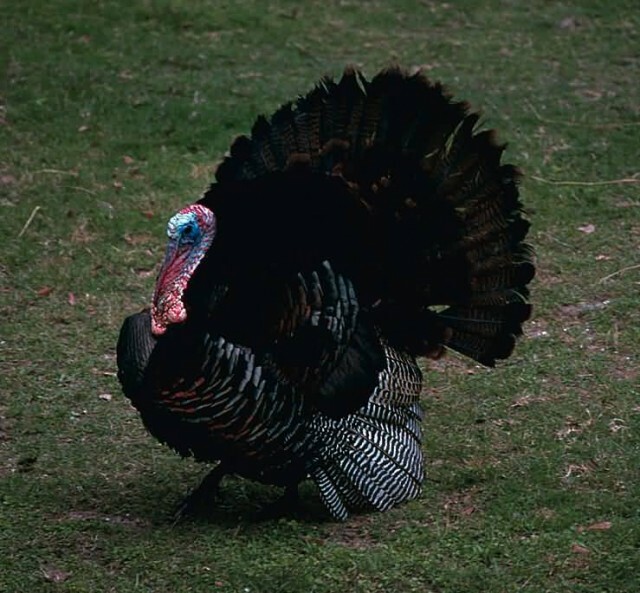 Turkey down and similar feathers have been used as a substitute for making ‘marabou’ trimming. 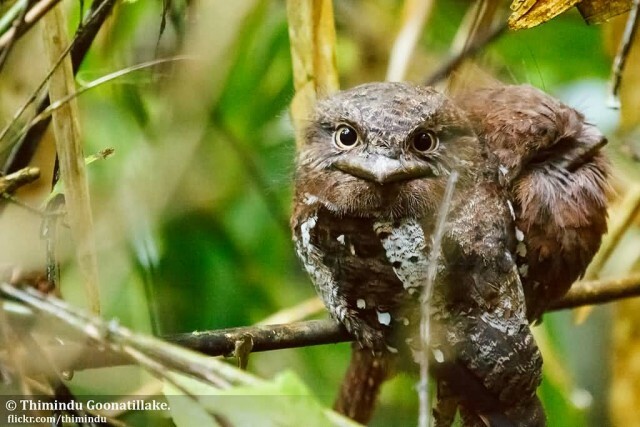 The Sri Lanka frogmouth, Sri Lankan frogmouth or Ceylon frogmouth is a small frogmouth found in the Western Ghats of south India and Sri Lanka. 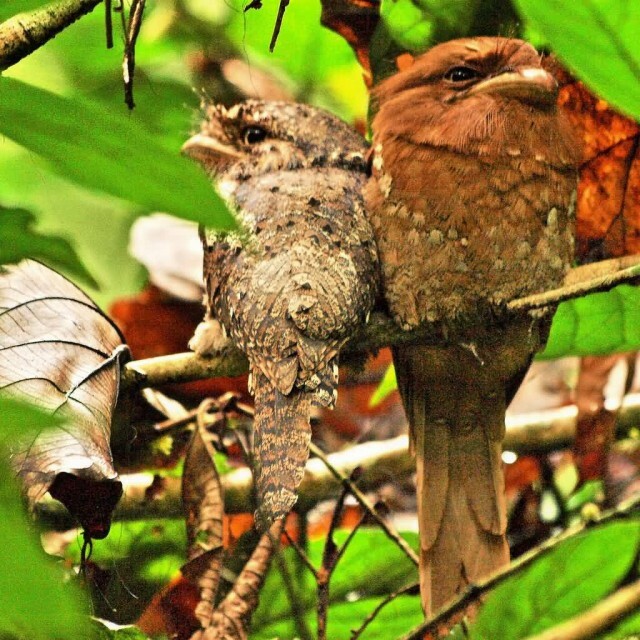 Related to the nightjars, it is nocturnal and is found in forest habitats. The plumage coloration resembles that of dried leaves and the bird roosts quietly on branches, making it difficult to see. Each has a favourite roost that it uses regularly unless disturbed. It has a distinctive call that is usually heard at dawn and dusk. The sexes differ slightly in plumage. This species is found in the Western Ghats of southwest India and Sri Lanka. Its habitat is tropical forest, usually with dense undergrowth. It can sometimes be found in more disturbed habitats, including plantations. Its presence may be overlooked due to its nocturnal behaviour and camouflage. This species is found in the Western Ghats of southwest India and Sri Lanka. Its habitat is tropical forest, usually with dense undergrowth. It can sometimes be found in more disturbed habitats, including plantations. Its presence may be overlooked due to its nocturnal behaviour and camouflage. 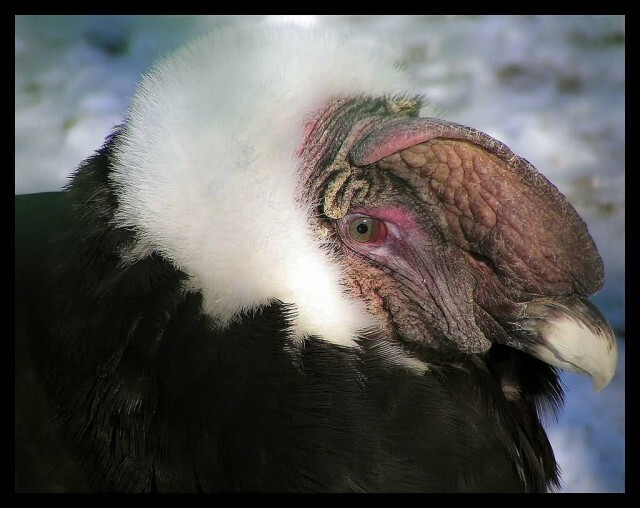 The Andean condor is a South American bird in the New World vulture family Cathartidae and is the only member of the genus Vultur. 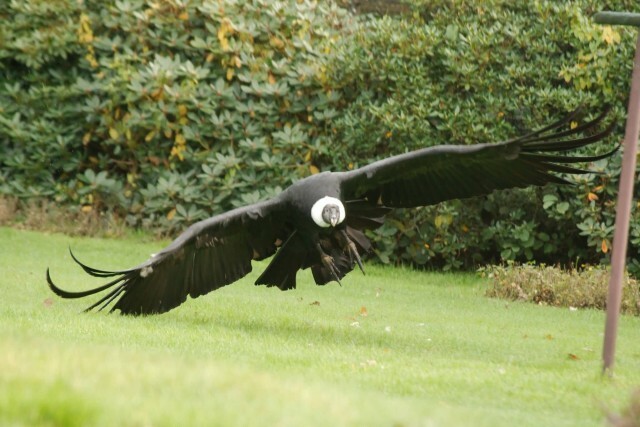 Found in the Andes mountains and adjacent Pacific coasts of western South America, the Andean condor has a wingspan of up to 3.2 m but is exceeded by the wandering albatross, the southern royal albatross, the Dalmatian and the great white pelicans. It is a large black vulture with a ruff of white feathers surrounding the base of the neck and, especially in the male, large white patches on the wings. The head and neck are nearly featherless, and are a dull red color, which may flush and therefore change color in response to the bird’s emotional state. In the male, there is a wattle on the neck and a large, dark red comb or caruncle on the crown of the head. Unlike most birds of prey, the male is larger than the female. 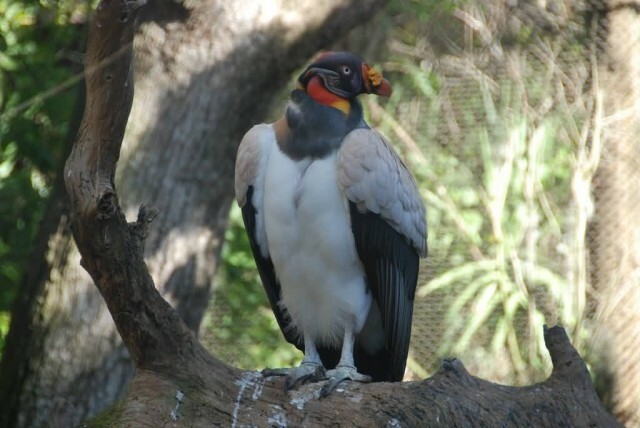 The king vulture is a large bird found in Central and South America. It is a member of the New World vulture family Cathartidae. This vulture lives predominantly in tropical lowland forests stretching from southern Mexico to northern Argentina. It is the only surviving member of the genus Sarcoramphus, although fossil members are known. 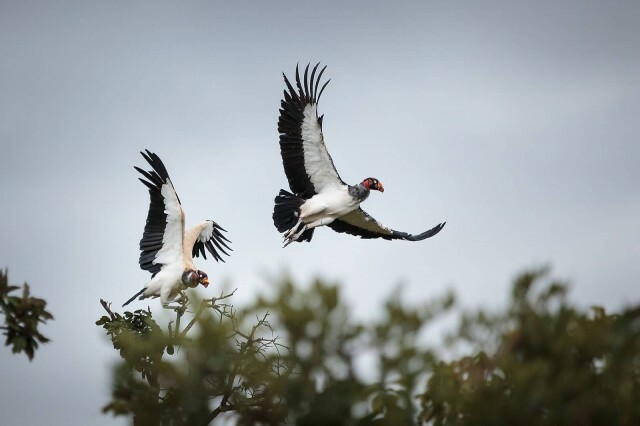 Large and predominantly white, the king vulture has gray to black ruff, flight, and tail feathers. The head and neck are bald, with the skin color varying, including yellow, orange, blue, purple, and red. 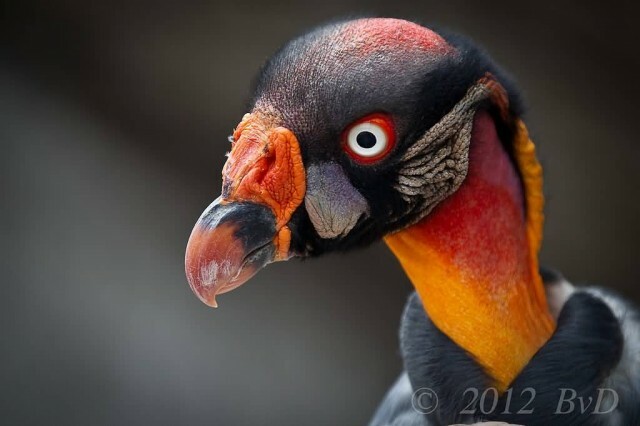 The king vulture has a very noticeable yellow fleshy caruncle on its beak. 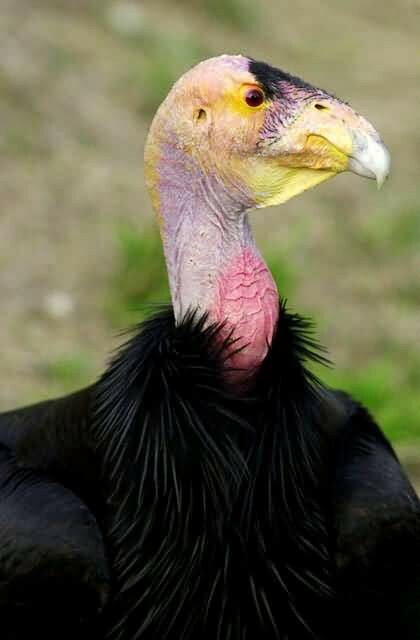 This vulture is a scavenger and it often makes the initial cut into a fresh carcass. It also displaces smaller New World vulture species from a carcass. King vultures have been known to live for up to 30 years in captivity. King vultures were popular figures in the Mayan codices as well as in local folklore and medicine. Although currently listed as least concern by the IUCN, they are decreasing in number, due primarily to habitat loss. 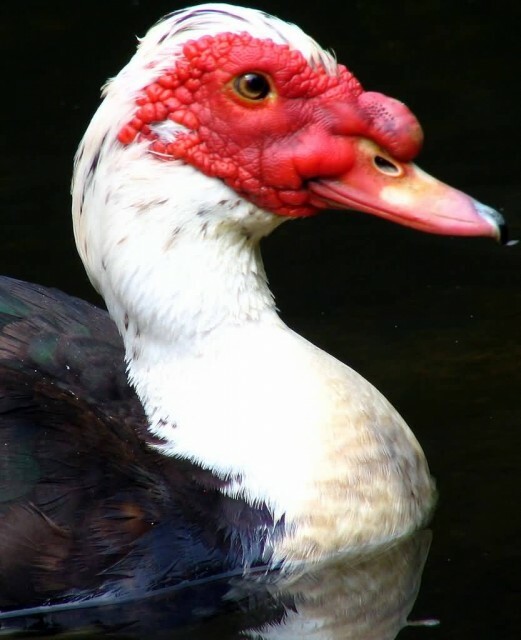 The Muscovy duck is a large duck native to Mexico, Central, and South America. Small wild and feral breeding populations have established themselves in the United States, particularly in the lower Rio Grande Valley of Texas and Florida as well as in many other parts of North America, including southern Canada. 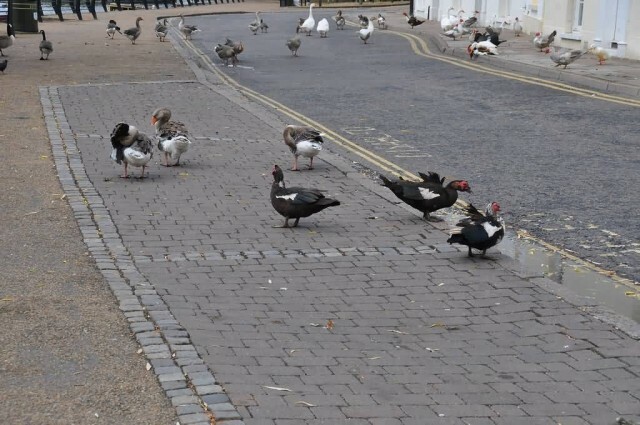 Feral Muscovy ducks are found in New Zealand, Australia, and in parts of Europe. They are a large duck, with the males about 76 cm long, and weighing up to 7 kg. Females are considerably smaller, and only grow to 3 kg, roughly half the males’ size. The bird is predominantly black and white, with the back feathers being iridescent and glossy in males, while the females are more drab. 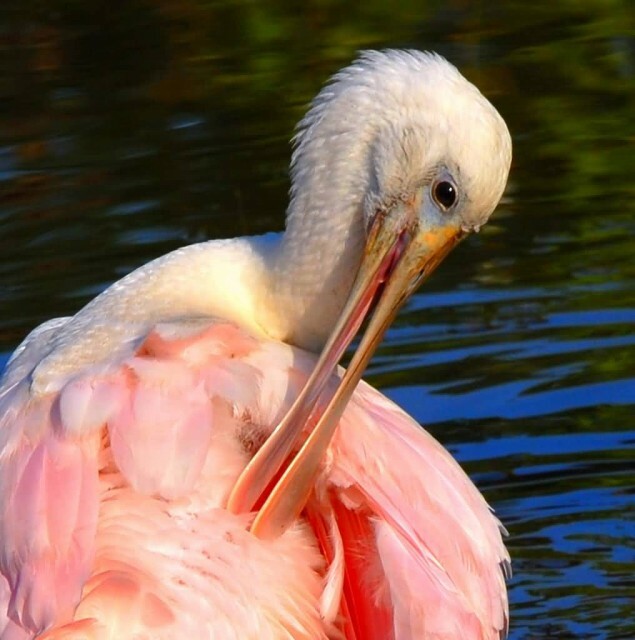 The amount of white on the neck and head is variable, as well as the bill, which can be yellow, pink, black, or any mixture of these. They may have white patches or bars on the wings, which become more noticeable during flight. 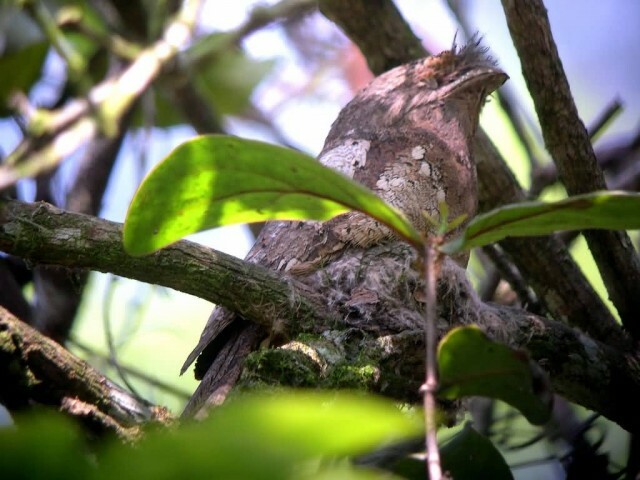 Both sexes have pink or red wattles around the bill, those of the male being larger and more brightly colored. 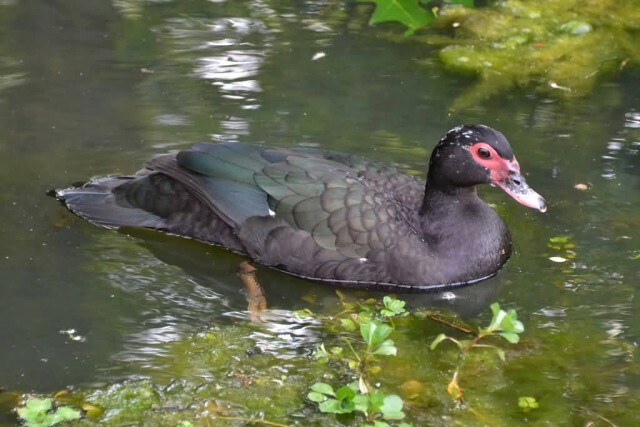 The domestic breed, Cairina moschata forma domestica, is commonly known in Spanish as the pato criollo. They have been bred since pre-Columbian times by Native Americans and are heavier and less able to fly long distances than the wild subspecies. Their plumage color are also more variable. Other names for the domestic breed in Spanish are pato casero and pato mudo. 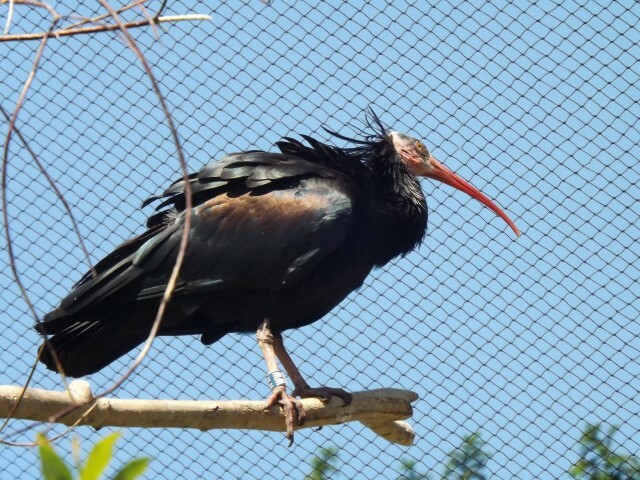 The northern bald ibis, hermit ibis, or waldrapp is a migratory bird found in barren, semi-desert or rocky habitats, often close to running water. This 70–80 cm glossy black ibis, which, unlike other members of the ibis family, is non-wading, has an unfeathered red face and head, and a long, curved red bill. It breeds colonially on coastal or mountain cliff ledges, where it typically lays two to three eggs in a stick nest, and feeds on lizards, insects, and other small animals. 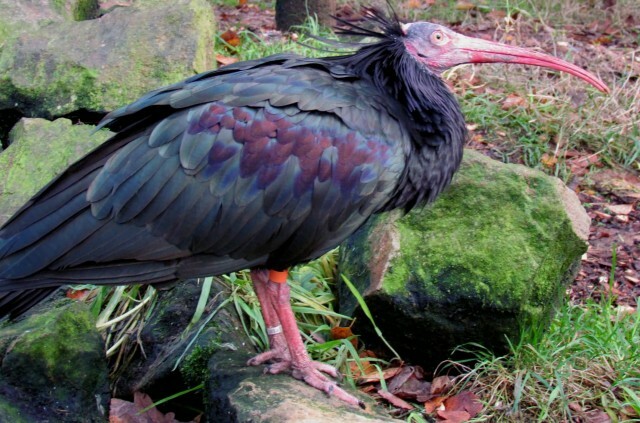 The northern bald ibis was once widespread across the Middle East, northern Africa, southern and central Europe, with a fossil record dating back at least 1.8 million years. It disappeared from Europe over 300 years ago, and is now considered critically endangered. There are believed to be about 500 wild birds remaining in southern Morocco, and fewer than 10 in Syria, where it was rediscovered in 2002. 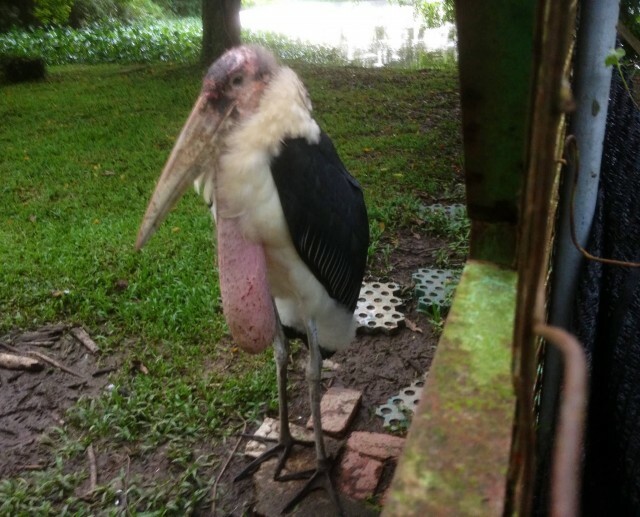 To combat this ebb in numbers, recent reintroduction programs have been instituted internationally, with a semi-wild breeding colony in Turkey, as well as sites in Austria, Spain, and northern Morocco. The reasons for the species’ long-term decline are unclear, but hunting, loss of foraging habitat, and pesticide poisoning have been implicated in the rapid loss of colonies in recent decades.